Gather all the stem parts of the vegetables in one hand and slip a rubber band over the bottom part of the stems, so that all the vegetables are held together in one bunch. Alternatively, tie the bunch with cotton kitchen string. Bring plenty of water to a boil in a medium pot. Add some salt and simmer the vegetables until firmly cooked, about 2 minutes. To do this, first place the tied stem part in the boiling water, holding the leafy top part with tongs or a pair of cooking chopsticks. After counting to about 30, plunge the leafy part into the water and cook the vegetables for the remaining 1 1/2 minutes. Remove the vegetables from the water and cool under running cold tap water. When the vegetables are cooled, squeeze firmly to remove excess water. In a medium bowl combine 1 teaspoon shoyu (Japanese soy sauce) and 2 tablespoons dashi. Marinate the vegetables in the mixture and set aside. Heat a skillet over medium heat. When it is hot, add the sesame seeds and toast until the seeds are plump, about 1 to 2 minutes. Transfer the sesame seeds to a Japanese suribachi mortar or food processor and process while hot until the color becomes gray and releases a fragrant aroma. Remove the vegetables from the marinade, squeeze firmly to remove excess water. Cut the vegetables into 2-inch lengths. 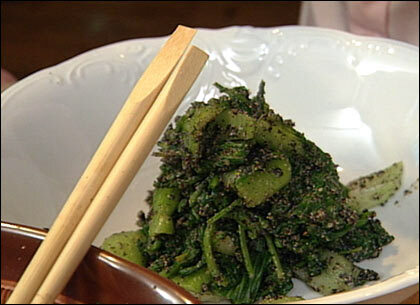 Dress the vegetables with the sesame dressing. Serve the salad in a communal medium-sized bowl or individual small bowls. Wipe the kombu with a damp cotton cloth or paper towel. In a large pot, bring the water and kombu almost to a boil over low-medium heat. Cook the kombu for 10 minutes. Remove the kombu and preserve for the dashi preparation. Add the fish flakes all at once and count to 10. Turn off the heat, skim off any foam, and let the mixture stand for 2 minutes. Strain the stock through a sieve lined with a tightly woven cotton cloth. Discard the bonito flakes, or preserve them for the second stock. Refrigerate the stock, tightly covered, for up to four days, or freeze it. This segment appears in show #2807.